One thing that’s always impressive about Springfield Armory gear is the packaging and extras. While many companies try to cut corners by including minimal accessories and using cheap cardboard boxes, the Springfield Armory folks tend to do it right. This pistol arrived in a 12×15-inch hard plastic case complete with locking tabs and two holes for padlocks. It’s ready for secure transport, even for commercial air travel. Inside, you’ll find the expected spare magazines and additional mounting plates for different optics types. But that’s not all. The pistol also ships with a standard non-threaded barrel, so if you want to use your XD(M) for carry or other lower-profile use, just swap that barrels and you’re good to go. I broke out the ruler to see the difference between the two. 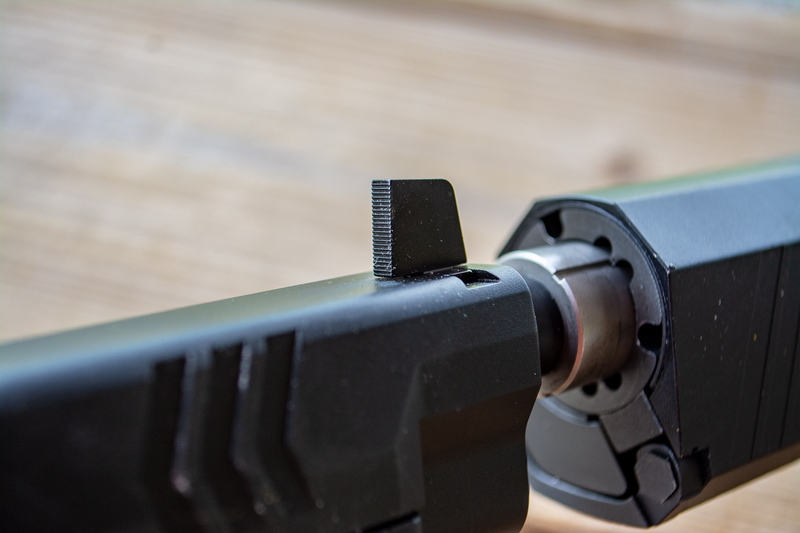 With the standard barrel installed, the muzzle protrudes just about ⅛ of an inch beyond the slide, while the threaded barrel extends ¾ of an inch. Two versions of the OSP Threaded are available: one with a Vortex Venom sight included and one without. Both have three mounting plates for different optics. The basic features of the XD(M) full-size pistol are the same as those of previous versions, so we won’t re-hash all that here. Instead, let’s focus on the optics and threaded features that make this different from previous models. 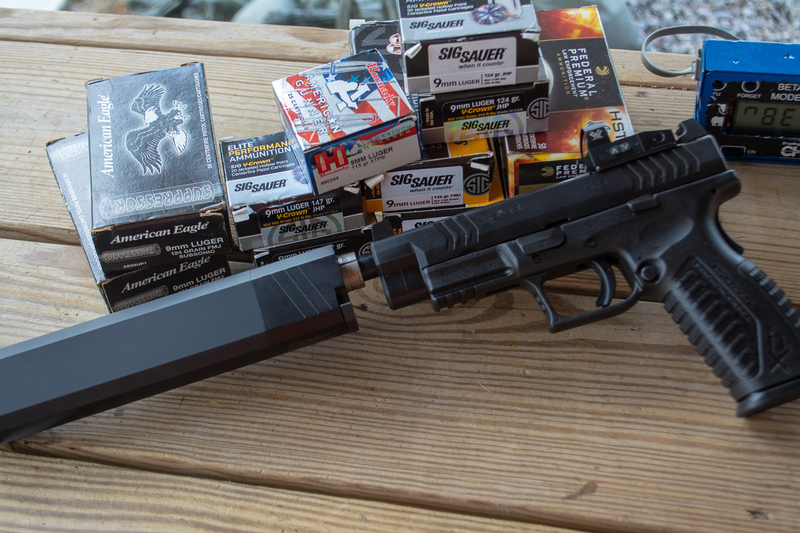 The obvious primary requirement for a suppressor-ready pistol is a compatible threaded barrel. The pattern on the threaded barrel is 1/2×28, which is standard for most 9mm pistols. The sights are suppressor height so they are visible over this .45 caliber silencer and through the window of the red dot optic. In my view, the optics mounting system is also a “suppressor-ready” feature as one of the little gotchas when adding a pistol suppressor is that you normally can’t use the standard sights anymore – the suppressor body blocks all or most of the iron sight picture. The optic, with its higher sight plane, solves this problem handily. I had a perfect and unobstructed view even when using a larger .45 caliber suppressor. More on that later. 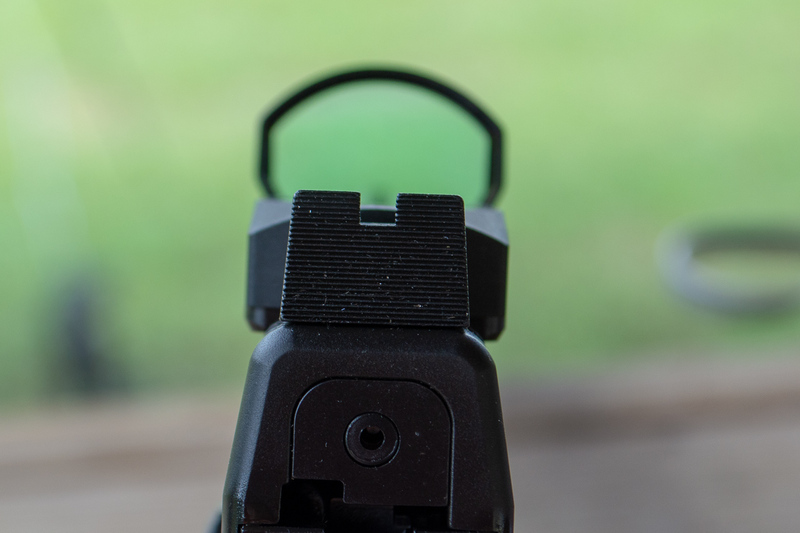 To support red dot sights, the company includes three mounting plates plus a slide cover. 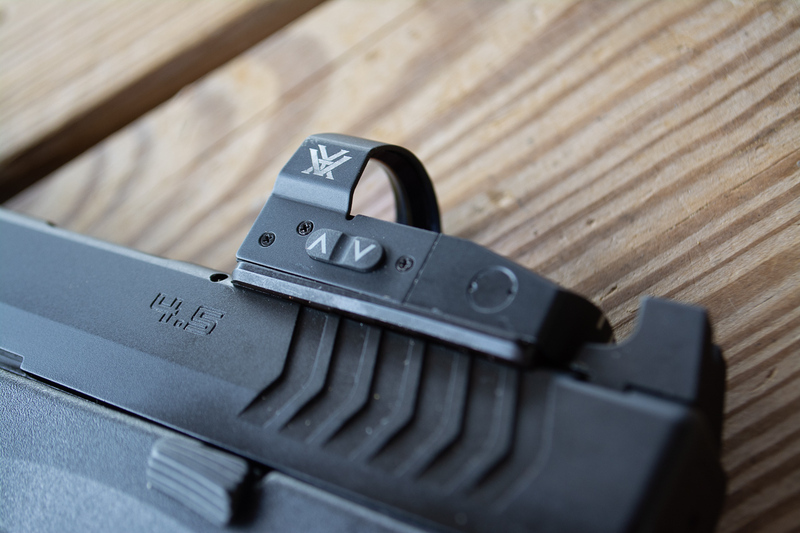 If you order the OSP with Venom sight package, plate 1 will already be installed as it fits the Vortex sight. Plates 2 and three allow attachment of other sight brands. The cover is useful if you want to use the pistol without an optic as it provides a smooth slide surface along the top just like on a standard XD(M) pistol. There is a fourth mystery plate packaged with the others. While not intended to use used on the OSP pistol the Vortex folks include it in case you want to move the Venom to another rifle or pistol with a standard rail and Springfield passes it along as a convenience. While you can see the iron sights through the optic, they’re positioned low so they’re out of the way when using the red dot. The last “suppressor feature” is the inclusion of taller suppressor sights. Both front and rear steel sights are extra tall for two reasons. First, the added height allows you to see through the sights over a suppressor body. Second, the taller sights provide a backup solution for the optics. These iron sights are positioned so that you can see them in the bottom 15 or 20% of the Vortex Venom optical sight. They’re way down low in the sight picture, so they’re out of the way when you’re relying on the red dot. However, if the dot fails, the iron sights are usable without removing the optic itself. Keep in mind that the position of these sights in the optic window may vary a bit if you choose a red dot sight other than the Vortex. You can order the OSP in one of two configurations, with or without the Vortex Venom. If you already have a red dot or prefer a different model, no worries. 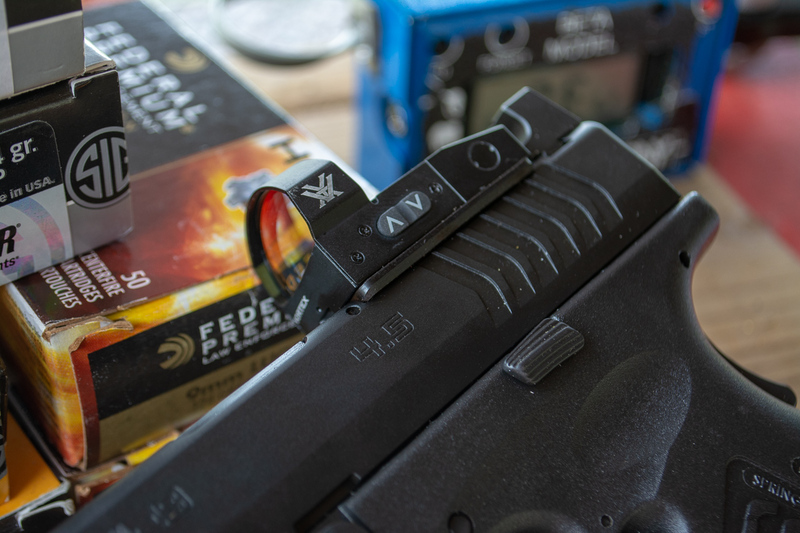 Both packages come with the same mounting plate options to fit sights including, but not limited to, the Burris FastFire, Leupold DeltaPoint, J-Point, and Trijicon RMR. The Vortex Venom has adjustable intensity for its 3 MOA dot and features an optional automatic off mode. The Vortex Venom red dot sight sports a three-MOA dot size with ten intensity levels. Up and down arrow buttons on the left side allow you to choose brightness. At the lower levels, you can leave the dot illuminated full time. The manufacturer says that you’ll get up to 30,000 hours in manual mode on the lowest setting. That’s about three years on continuous operation before changing batteries. If you leave it in the brightest setting, you’ll get 150 hours. I’m finding that I like level 3 for indoor use, so I expect I can leave this on for many months before changing batteries. There’s also an automatic mode that powers off the unit after 14 hours of inactivity. When using that way, you’ll have to remember to turn on the red dot manually to revive it. For home defense use, I’ll stick with the “always on” option and figure out how frequently I need to change batteries to avoid an outage. The battery compartment is accessible from the top, so you don’t have to remove the sight – and lose your zero – to change the battery. I started off checking the handling with some offhand and informal shooting. As with its predecessors, the standard full-size XD(M) and OSP models, this pistol features a 1911 grip angle, so it’s more vertical than, say, a Glock. It points naturally for me. The trigger weighed in at 5.25 pounds according to my Timney Triggers scale. The slide is easy to rack, in part because the Vortex optic provides plenty of surface area for your racking hand. While I did force myself to shoot this pistol unsuppressed, at least a little, I did most of the shooting using a SilencerCo Osprey 45 suppressor. That’s what it’s built for, right? I did almost all accuracy and velocity testing using a SilencerCo Osprey 45 suppressor. To avoid shooting my chronograph, I started with some 25-yard shots to verify the zero of the Venom red dot. For me, the factory setting was about 1 ½ inches low and left of my aim point, so I made some quick elevation and windage adjustments to get most ammo types near the bullseye area. I shot a pile of rounds through my chronograph from a distance of 15 feet, in part because I keep geeky records like that but also to function test the pistol. No failures or hangups. The pistol arrived well-lubricated, and I took it straight to the range with no preliminary maintenance, cleaning, or oiling. I also wanted to see the velocity difference between the longer threaded barrel with a suppressor attached and that of the standard barrel, which is about ¾ inches shorter. As I expected, there was about a 40 foot per second difference for one of the loads tested. Here’s the rundown on measured velocities. Accuracy testing was easy thanks to the red dot sight. 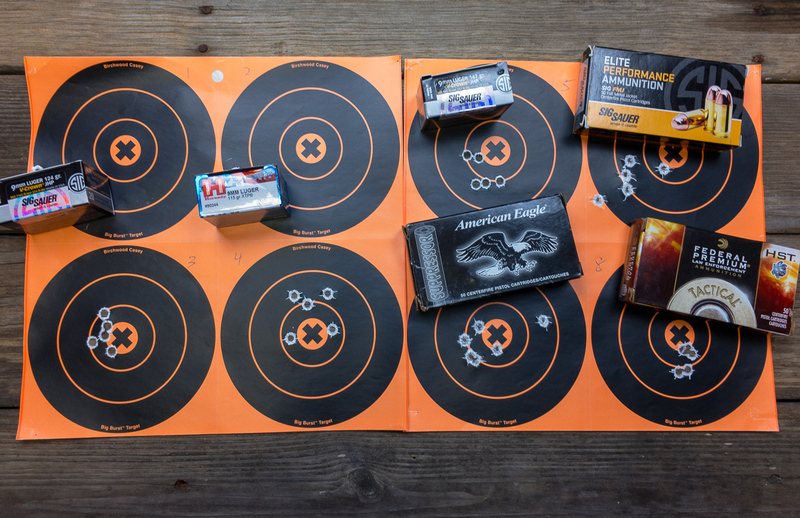 With pistols, most of the challenge is getting a perfect sight picture at 25 yards to see what the gun will do when optical imprecision is factored out. Cranking the red dot down to a lower power level gave me a nice crisp dot and a rest weighed down with a bag of lead shot provided a stable shooting platform. I fired five-shot groups with all the ammo I used for velocity and function testing and came up with the following results. 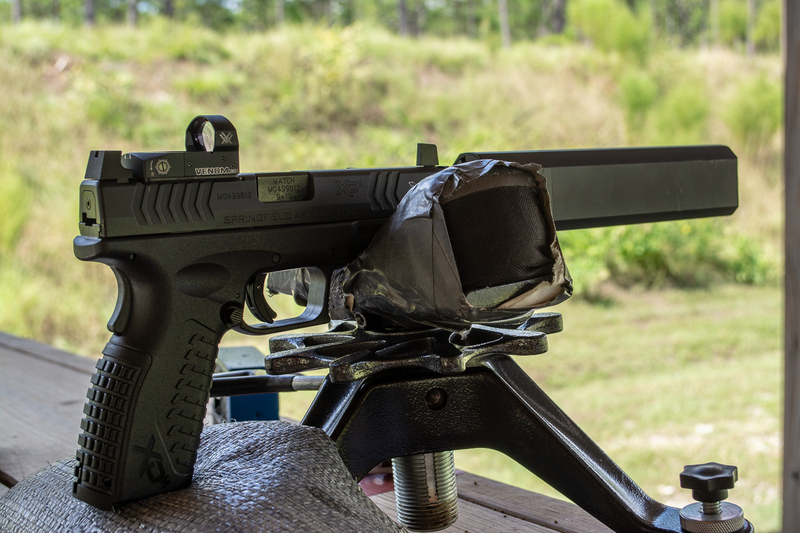 I’ve tested Springfield Armory XD(M) pistols in the past and have always been impressed with their accuracy. This model certainly lived up to that reputation. You always read marketing specs that talk about “match grade barrels” and so on. Well, here’s where the rubber meets the road on whether that’s marketing fluff of meaningful data. The results speak for themselves in this case; the pistol will perform. These 25-yard, five-shot groups show that the XD(M) OSP Threaded will shoot. On the subjective side, this pistol is easy to shoot. As a full-size 9mm, recoil is a non-issue. Adding the suppressor mitigates blast and recoil even more, making this handle more like a .22 pistol than a centerfire. The grip surface is aggressive, and in the hot and sweaty South Cackalackee range conditions, I had no trouble maintaining control without having to readjust my grip. I also liked the Vortex Venom red dot. I’ve used a Trijicon RMR quite a bit, and while it’s effective and plenty durable, it does have a smaller window, so some training is required to reliably find the dot quickly. The Venom has a much larger window and less bulky surrounding frame. The result is that the sight doesn’t interfere with your vision nearly as much. It’s fast and easy to acquire. All said and done, this is a fantastic suppressor platform. I’m sending a check so I can keep this one. The post What a Suppressed Pistol Should Be: The New Springfield Armory XD(M) OSP Threaded appeared first on AllOutdoor.com. ← Del Grano a La Taza: ¿Cómo Cultivan Café los Productores?